This tree follows Milner and Sequeira (1994, 1998), Yates and Warren (2000), Steyer (2000), and Laurin and Soler-Gijón (2006). Temnospondyls are a very large and widespread extinct clade of stegocephalians. They are known from the Visean (Lower Carboniferous, about -340 m.y.) to the Lower Cretaceous (-120 m.y.) and have been found on all continents, from Greenland to Antarctica. More than twelve families are known, gathering about 90 genera (Milner, 1993). Temnospondyls show a great diversity of forms, resembling large salamanders, crocodiles or gavials, with brevirostral (short-snouted; Fig. 1C) to longirostral (long-snouted) skulls (Fig. 1D). Their size ranges from about 20 cm to 3 m in length. Aquatic, semi-aquatic, amphibious or terrestrial, this opportunist group occupied a great range of ecological niches, especially during the Upper Carboniferous and the Lower Permian. From the Upper Permian to their demise in the Lower Cretaceous, temnospondyls are largely (if not entirely) restricted to aquatic habitats; i.e. they were found in fresh waters on continents and in the seas (Lindeman, 1991). 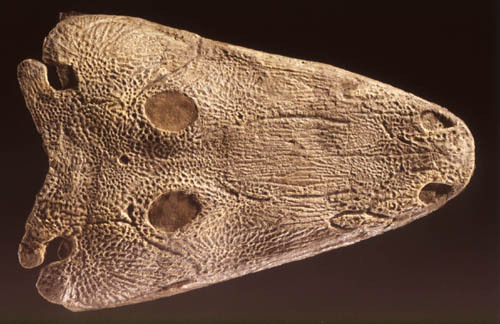 The skull of temnospondyls is triangular to parabolic, and it is often heavily ornamented (in large, mature individuals) with a polygonal pattern of ridges (Fig. 2) also found in many other early stegocephalians (baphetids, seymouriamorphs, captorhinid amniotes, etc.). This ornamentation indicates that the skin was tightly attached to the skull. Sensory-line grooves are visible on the skull of the adults (as well as juveniles) of several species (Fig. 2). This indicates a fully aquatic lifestyle of these taxa (at least some larvae had external gills, so they were also aquatic). Temnospondyls retained all the dermal bones found in most other groups of stegocephalians, with possible extra bones (such as an internasal, an interfrontal, an interparietal, etc.). These extra bones have been observed in numerous taxa, such as Eryops (Fig. 1B), some dissorophoids (Fig. 1C), and some triassic stereospondyls (Gubin, Novikov and Morales, 1997). The palate is pierced by a wide interpterygoidal fenestra (the most obvious autapomorphy of this group; Fig. 3B), and it retains large palatal tusks. The sharp, conical, numerous teeth, and the large palatal fangs of temnospondyls suggest that they were predators (carnivorous, insectivorous, piscivorous, or any combination thereof). Aquatic temnospondyls have been considered either as passive, benthic ambush predators, active nectonic predators, or surface hunters (Sennikov, 1996). Figure 1. Temnospondyl skulls in dorsal view. A, Dendrerpeton acadianum. B, the eryopid Eryops megacephalus. C, the dissorophoid Tersomius texensis. D, the archegosaurid Melosaurus vetustus. Redrawn from A, Holmes, Carroll and Reisz (1998); B, from Sawin (1941); C, from Carroll (1964); and D, from Konzhukova (1955). Abbreviations: Bc, braincase; F, frontal; In, internasal; J, jugal; L, lacrimal; M, maxilla; N, nasal; P, parietal; P. f., pineal foramen; Pm, premaxilla; Po, postorbital; Pof, postfrontal; Pp, postparietal; Prf, prefrontal; Pt, pterygoid; Q, quadrate; Qj, quadratojugal; Sq, squamosal; St, supratemporal; T, tabular. Pictures copyright © 2000 Jean-Sébastien Steyer and Michel Laurin. Figure 2. Skull of the stereospondyl Parotosaurus. The sculpturing pattern of ridges and the grooves for the lateral-line organ are obvious. The otic notch, at the back of the skull, is almost closed posteriorly, in this genus. Picture copyright © 2000 D. Serrette, MNHN. The skull of temnospondyls is emarginated posteriorly by an otic notch (also called a temporal emargination, or a squamosal notch). This structure (Fig. 2) has long been thought to have supported a tympanum (or ear drum) because a similar emargination in several extant taxa (urodeles, crocodilians, squamates, turtles) is associated with a tympanum (Bolt and Lombard, 1985). However, we now know that several early stegocephalians, including some early temnospondyls, retained a massive stapes that is incompatible with the presence of a functional tympanum (Clack, 1983, 1992; Godfrey, Fiorillo and Carroll, 1987). Therefore, it is likely that the first temnospondyls did not have a tympanum; whether or not it developed later in the group is still uncertain (Laurin, 1998a; Laurin and Soler-Gijón, 2006). The vertebrae are ‘rhachitomous’ (with a large, ventral, crescentic intercentrum and a small, dorsal, paired pleurocentrum) to stereospondylous (without an ossified pleurocentrum, although this element may be retained in a cartilaginous state). These variations in vertebral pattern formed the basis of about seven different classifications proposed by various authors from Cope (1882) to Romer (1947). These classifications, only based on configurations of the vertebrae, have been abandoned by most systematists because: i) different types sometimes occur all along a same vertebral column; ii) some taxa show intermediate morphologies; iii) classifications based on various states of a single character usually include paraphyletic taxa; for instance, the rhachitomous configuration is primitive compared to the stereospondylous one, and it is perhaps primitive for stegocephalians (Laurin, 1998b). Temnospondyls are the best documented early stegocephalian taxon in the fossil record. Extensive growth series have been recognized in numerous species of various taxa, such as Dendrerpetonidae (Milner, 1980), Eryopidae (Werneburg and Steyer, 1999), Archegosauridae (Werneburg and Steyer, 2000), Zatrachydidae (Boy, 1989), Branchiosauridae (Schoch, 1992; Boy, 1974), and Capitosauridae (Damiani and Warren, 1997). Even if metamorphosis has not been clearly proved in temnospondyls (Boy, 1974; Steyer, 1996), growth has been studied from larval to adult stages (Steyer et al., 2004). Developmental heterochronies have been highlighted in temnospondyls thanks to comparative ontogeny (Schoch, 1995; Steyer, 2000) and histology (Ricqlès, 1975). 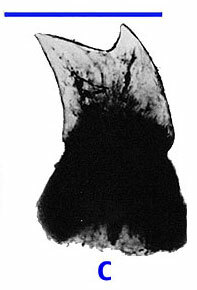 For example, ontogenetic processes leading to longirostry may be due to hypermorphosis of the skull, whereas those leading to brevirostry may be due to paedomorphosis (Ricqlès, 1975; Schoch, 1995; Steyer, 2000). Various developmental characters, such as patterns of digit development (Fröbisch et al., 2007) and especially ossification sequences of cranial bones, have been compared between urodeles and branchiosaurs to assess the origin of extant amphibians. Although early studies on cranial sequences of ossifiction concluded that enough similarities were present between branchiosaurs and urodeles to suggest close affinities between both taxa (Schoch and Carroll, 2003), subsequent studies using more sophisticated approaches have concluded that these data did not support a temnospondyl origin of urodeles (Schoch, 2006; Germain and Laurin, 2009). Temnospondyls have long played a prominent role in scenarios and theories on the origin of anurans (Carroll, 1988). Several authors have suggested that modern amphibians originated from within the Temnospondyli. Skulls of dissorophids (Fig. 3A, B) and branchiosaurs (Temnospondyli) have been compared with skulls of anurans and salamanders (Lissamphibia) to support the temnospondyl origin of lissamphibians (Watson, 1940; Bolt, 1969). The presence of bicuspid, pedicellate teeth in small, paedomorphic or immature temnospondyls (Fig. 3C) is probably the most convincing argument in favor of a temnospondyl origin of lissamphibians (Bolt, 1969). Figure 3. Cranial anatomy of the juvenile or paedomorphic dissorophoid Doleserpeton, that has been thought to be closely related to lissamphibians. A. Dorsal view of the skull. B. Palatal view. Scale bar for A and B equals 1 mm. C. Bicuspid tooth (also found in lissamphibians). Scale bar equals 0.05 mm. Drawings A and B reproduced with permission from Bolt (1969). Copyright © 1969 American Association for the Advancement of Science. Photograph C reproduced with permission from from Bolt (1977). Copyright © 1977 Society for Sedimentary Geology. The presence of a tympanum has been inferred in at least some temnospondyls, and this has also been used to support the idea that temnospondyls included the closest known relatives of lissamphibians (Bolt and Lombard, 1985). However, among lissamphibians, only anurans have a tympanum, so this argument is not convincing because the tympanum has to be assumed to have been lost in urodeles and apodans (Laurin, 1998). Furthermore, recent computer-assisted phylogenetic analyses incorporating over 40 taxa and 150 characters (Laurin and Reisz, 1997; Laurin, 1998a) suggest that lissamphibians are more closely related to " lepospondyls " than to temnospondyls, and that temnospondyls represent a strictly extinct clade. Because of their long association with the origin of lissamphibians (Cope, 1888), temnospondyls have long been considered as amphibians (Gadow, 1897), but they were initially considered as Reptiles (Jaeger, 1828). They have also been placed in the taxa Labyrinthodontia (named after the folded structure of the dentine; Burmeister, 1850) or Stegocephali (named after their heavy skull roof; Cope, 1868). A recent proposal is to gather them under a redefined Stegocephali (Laurin, 1998a). A phylogeny of Mesozoic temnospondyls (including mostly stereospondyls) has been recently proposed (Yates and Warren, 2000). This study recognizes a monophyletic Stereospondyli that includes most (but not all) Mesozoic temnospondyls, and that became extinct (along with all other Temnospondyli) in the Lower Cretaceous. Previous studies had suggested multiple origins of Mesozoic temnospondyls among their Paleozoic relatives (Milner, 1990). Some recent phylogenetic analyses (Laurin and Reisz, 1997; Laurin, 1998a) have demonstrated the monophyly of temnospondyls. The phylogeny within temnospondyls has been studied by several authors (Milner and Sequeira, 1994, 1998; Yates and Warren, 2000; Steyer, 2000). Even if they did not include exactly the same terminal taxa and the same morphological characters, all these studies are congruent in their main conclusions, and have been summarized by the consensual tree (see above). For a discussion of the apomorphies that support the phylogeny within Temnospondyli, see the linked page Phylogeny and Apomorphies of Temnospondyls. Temnospondyli is a stem-based taxon including all choanates more closely related to Eryops than to amniotes (Laurin, 1998a). The proposition of de Queiroz and Gauthier (1992) of defining Temnospondyli as a stem-based taxon including all tetrapods more closely related to modern amphibians than to Amniota is rejected because the phylogeny of Laurin and Reisz (1997) suggests that this definition would exclude most genera that have been assigned to the Temnospondyli (Laurin, 1998a). Such a definition would also constitute a junior synonym of Amphibia, that had been thus defined (Gauthier et al., 1989). Bolt J. R. 1977. Dissorophoid relationships and ontogeny, and the origin of the Lissamphibia. Journal of Paleontology 51: 235-249. Bolt, J. R. & R. E. Lombard. 1985. Evolution of the amphibian tympanic ear and the origin of frogs. Zoological Journal of the Linnean Society 24: 83-99. Boy, J. A. 1974. Die Larven der rhachitomen Amphibien (Amphibia: Temnospondyli; Karbon—Trias). Paläontologische Zeitschrift 48: 236-268. Boy, J. A. 1989. Über einige Vertreter der Eryopoidea (Amphibia: Temnospondyli) aus dem europäischen Rotliegend (?höchstes Karbon-Perm) 2. Acanthostomatops. Paläontologische Zeitschrift 63: 133-151. Burmeister, H. 1850. Die Labyrinthodonten aus dem Saarbrücker Steinkohlengebirge, Dritte Abtheilung: der Geschichte der Deutschen Labyrinthodonten Archegosaurus. Berlin: G. Reimer, 74 pp. Carroll R. L. 1964. Early evolution of the dissorophid amphibians. Bulletin of the Museum of Comparative Zoology 131: 161-250. Carroll R. L. 1988. Vertebrate Paleontology and Evolution. New York: W. H. Freeman and Company, 698 pp. Clack, J. A. 1983. The stapes of the Coal Measures embolomere Pholiderpeton scutigerum Huxley (Amphibia; Anthracosauria) and otic evolution in early tetrapods. Zoological Journal of the Linnean Society 79: 121-148. Clack J. A. 1992. The stapes of Acanthostega gunnari and the role of the stapes in early tetrapods. In: D. B. Webster, R. R. Ray, and A. N. Popper (eds.) The evolutionary biology of hearing: 405-420. New York: Springer-Verlag. Cope E. D. 1868. Synopsis of the extinct Batrachia of North America. Proceedings of The Academy of Natural Sciences of Philadelphia: 208-221. Cope, E. D. 1882. Third contribution to the History of the Vertebrata of the Permian Formation of Texas. Proceedings of the American Philosophical Society 20: 447-474. Cope, E. D. 1888. On the intercentrum of the terrestrial vertebrate. Transactions of the American Philosophical Society 16: 243-253. Czerkas S. J. & S. A. Czerkas. 1990. Dinosaurs, a complete world history. Surrey: Dragon's World Ltd.
Damiani, R. J. & A. A. Warren. 1997. Re-interpretation of Parotosuchus wadei Cosgriff, a Capitosaurid from the Triassic Narrabeen Group at Gosford, New South Wales, with comments on its growth stage. Alcheringa 21: 281-289.
de Queiroz, K. & J. Gauthier. 1992. Phylogenetic taxonomy. Annual Review of Ecology and Systematics 23: 449-480. Gadow, H. 1897. On the evolution of the vertebral column of Amphibia and Amniota. Philosophical Transactions of the Royal Society of London B187: 1-57. Gauthier J., D. C. Cannatella, K. De Queiroz, A. G. Kluge, & T. Rowe. 1989. Tetrapod phylogeny. In: B. Fernholm, K. Bremer, and H. Jornvall (eds.) The Hierarchy of Life: 337-353. New York: Elsevier Science Publishers B. V. (Biomedical Division). Germain D. & M. Laurin. 2009. Evolution of ossification sequences in salamanders and urodele origins assessed through event-pairing and new methods. Evolution & Development 11: 170-190. Godfrey, S. J., A. R. Fiorillo, & R. L. Carroll. 1987. A newly discovered skull of the temnospondyl amphibian Dendrerpeton acadianum Owen. Canadian Journal of Earth Sciences 24: 796-805. Gubin, Y., I. Novikov, & M. Morales, 1997. Anomalies of skull roof morphology in some temnospondyl amphibians. In: Z. Rocek and S. Hart (eds.) Third World Congress of Herpetology: 87. Prague, Durabo Celakovice. Holmes, R. B., R. L. Carroll, & R. R. Reisz. 1998. The first articulated skeleton of Dendrerpeton acadianum (Temnospondyli, Dendrerpetontidae) from the Lower Pennsylvanian locality of Joggins, Nova Scotia, and a review of its relationships. Journal of Vertebrate Paleontology 18: 64-79. Jaeger, G. 1828. Über die fossile reptilien, welche in Württemberg aufgefunden worden sind. J.B. Metzler: Stuttgart. Konzhukova, E. D. 1955. The Permian and Triassic labyrinthodonts of the Volga basin and Cis-Urals. Trudy Paleontologicheskogo Instituta 49: 5-88 (in Russian). Laurin, M. 1998a. The importance of global parsimony and historical bias in understanding tetrapod evolution. Part I—systematics, middle ear evolution, and jaw suspension. Annales des Sciences Naturelles, Zoologie, Paris, 13e Série 19: 1-42. Laurin M. 1998b. The importance of global parsimony and historical bias in understanding tetrapod evolution. Part II—vertebral centrum, costal ventilation, and paedomorphosis. Annales des Sciences Naturelles, Zoologie, Paris, 13e Série 19: 99-114. Laurin M. & R. R. Reisz. 1997. A new perspective on tetrapod phylogeny. In: S. Sumida and K. Martin (eds.) Amniote Origins—Completing the Transition to Land: 9-59. London: Academic Press. Lindeman, F.J. 1991. Temnospondyls and the Lower Triassic Paleogeography of Spitzbergen. In: Z. Kielan-Jaworowska, N. Heintz, and H. A. Nakrem (eds.) Fifth Symposium on Mesozoic Terrestrial Ecosystems and Biota: 39-40. Oslo: Palaeontological Museum University of Oslo. Milner, A. R. 1980. The temnospondyl amphibian Dendrerpeton from the Upper Carboniferous of Ireland. Paleontology 23: 125-141. Milner A. R. 1990. The radiations of temnospondyl amphibians. In: P. D. Taylor and G. P. Larwood (eds.) Major Evolutionary Radiations 52: 321-349. Oxford: Clarendon Press. Milner, A. R. 1993. Amphibian-grade Tetrapoda. In : M. Benton (ed.) The Fossil Record 2. London: Chapman & Hall. Milner A. R. & S. E. K. Sequeira. 1994. 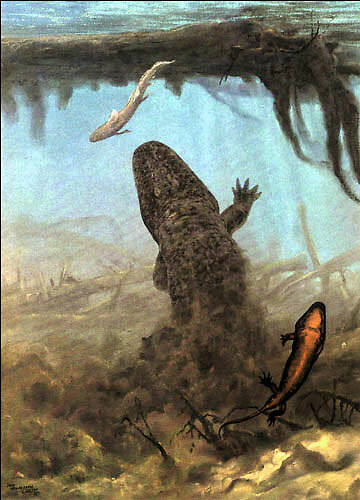 The temnospondyl amphibians from the Viséan of East Kirkton, West Lothian, Scotland. Transactions of the Royal Society of Edinburgh 84: 331-361. Milner A. R. & S. E. K. Sequeira. 1998. A cochleosaurid temnospondyl amphibian from the Middle Pennsylvanian of Linton, Ohio, U.S.A. Zoological Journal of the Linnean Society 122: 261-290. Ricqlès A. de 1975. Quelques remarques paléo-histologiques sur le problème de la néoténie chez les stégocéphales. Problèmes actuels de paléontologie-évolution des vertébrés: 351-363. Paris: C.N.R.S. Romer, A. S. 1947. Review of the Labyrinthodontia. Bulletin of the Museum of Comparative Zoology 99: 1-368. Sawin H. J. 1941. The cranial anatomy of Eryops megacephalus. Bulletin of the Museum of Comparative Zoology 88: 407-463. Schoch R. R. 1992. Comparative ontogeny of Early Permian branchiosaurid amphibians from Southwestern Germany. Palaeontographica. Abteilung A. Palaeozoologie-Stratigraphie 222: 43-83. Schoch R. 1995. 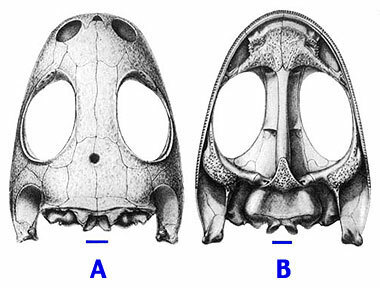 Heterochrony in the development of the amphibian head. In: K. J. McNamara (ed.) Evolutionary Change and Heterochrony: 107-124. New York: John Wiley & Sons. Schoch R. M. 2006. Skull ontogeny: developmental patterns of fishes conserved across major tetrapod clades. Evolution & Development 8: 524-536. Sennikov, A. G. 1996. Evolution of the Permian and Triassic tetrapod communities of Eastern Europe. Palaeogeography, Palaeoclimatology, Palaeoecology 120: 331-351. Steyer, J. S. 1996. Readaptation to the aquatic environment and developmental heterochronies in the eryopoids (Amphibia, Temnospondyli). In: J. M. Mazin, P. Vignaud, and V. de Buffrénil (eds.) Review of the International Multidisciplinary Congress of Secondary Adaptation to Life in Water: 82-83. Poitiers, France. Steyer J. S. 2000. Ontogeny and phylogeny of temnospondyl amphibians, a new method of analysis. Zoological Journal of the Linnean Society 130: 449-467. Steyer J.-S., M. Laurin, J. Castanet, & A. de Ricqlès. 2004. First histological and skeletochronological data on temnospondyl growth; palaeoecological and palaeoclimatological implications. Palaeogeography, Palaeoclimatology, Palaeoecology 206: 193-201. Watson, D. M. S. 1940. The origin of frogs. Transactions of the Royal Society of Edinburgh 60:195-231. Werneburg, R. & J. S. Steyer. 1999. Redescription of the holotype of Actinodon frossardi Gaudry, 1866 from the Lower Permian of the Autun basin (France). Geobios 32: 599-607. Werneburg, R. & J. S. Steyer. 2000. Redescription of the type species Cheliderpeton vranyi Fritsch 1877 (Amphibia, Temnospondyli) from the Lower Permian of Czech Republic (Bohemia). Paläontologische Zeitschrift, in press. Yates, A. M. & A. A. Warren. 2000. The phylogeny of the ‘higher’ temnospondyls (Vertebrata: Choanata) and its implications for the monophyly and origins of the Stereospondyli. Zoological Journal of the Linnean Society 128: 77-121. The temnospondyl Eryops lunges after the shark Orthacanthus. Another, smaller temnospondyl (Trimerorhachis) swims in the foreground. Note that the hand should have four digits (not five). From Czerkas S. J. & S. A. Czerkas. 1990. Dinosaurs, a complete world history. Surrey: Dragon''s World Ltd.
We thank Mr. Douglas Henderson, Dr. John Bolt, Dr. M. Véran, and Mr. D. Serrette for giving us permission to reproduce some illustrations (reconstruction of Eryops and Trimerorhachis, of Doleserpeton, and of Parotosaurus), and Dr. Katja Schulz for technical assistance.